Math is SJ’s favorite subject so I’ve created baskets to keep her busy when she is bored or just wants something to do. 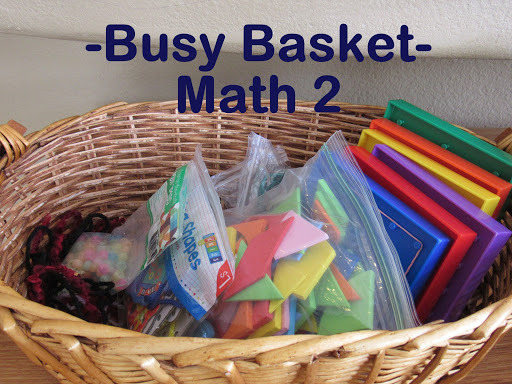 We have two math baskets since all the activities wont fit in one. The first basket has flash cards that we use pretty often with KJ (3). We have him name the numbers in English and Spanish and put them in order. The card game Jump which is a cross between phase ten and rummy this is great to teach kids sequential order, counting by 2’s, 3’s and 5’s. SJ enjoys puzzles so we house the latest dollar store puzzle in the basket. 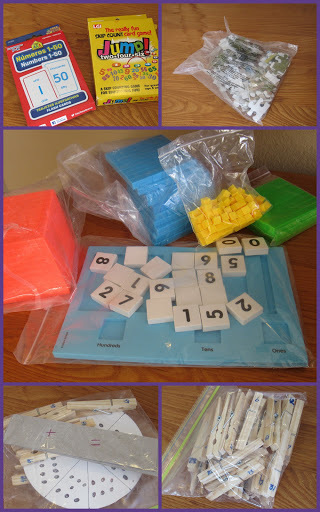 We use base ten blocks to teach the kids place value. They like to use the blocks to build (even though they aren’t supposed to) but since we taught them to write out numbers for the other to decode with the blocks they love it! The last items in this basket are the clothespin games. You can read about the instructions here. If the first basket was geared more toward SJ (5) this one is geared more towards KJ. It’s focus is fine motor skills. The Lacing Shaper is a $1 find from Target. The objective is to lace a shoelace like string through a hole punched robot. 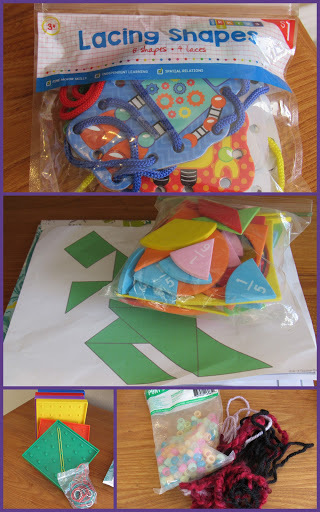 I keep a folder in this basket of tangram pictures along with a baggie holding the shapes. The baggie also hold fraction circles. We have not formally began teaching fractions but the kids love playing with them and can answer questions about how many it takes to make a whole. Geoboards have been a life saver for me. I hardly ever get rebuttal when I tell the kids to go get a geoboard. Finally I let the kids use yarn and beads to practice making patterns. 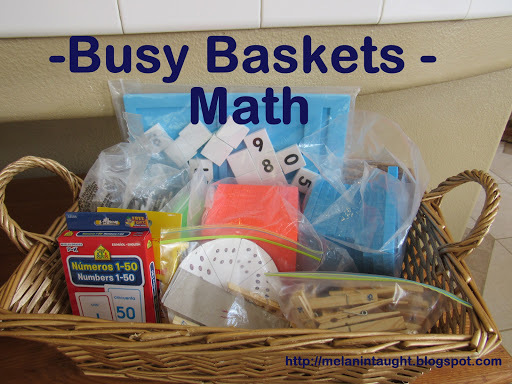 All of these activities keep them busy while teaching them important math skills. I hope you find these activities useful!